Small critters matter as well! The Dutch Small Mustelid Working Group (WKM) has intensified its investigations into the conservation status of small Mustelids (Least weasel, Stoat and Pole cat) in the Netherlands. In practice this is a very difficult to study species group. There is suspicion that these animals are declining in the intensely used and managed Dutch countryside, a hunch shared with researchers in England, Denmark, Germany and Switserland, and increasingly substantiated. The decline factors are not well known, but may be several interactive factors including dessication, habitat fragmentation in combination with dense and intensified road networks, dissapperance of cyclic vole outbreaks and possibly the increased use of second generation anticoagulant rodenticides (SGARs). In 2012 the WKM started field trials to test new practical methods to detect and monitor small mustelids at several sites containing likely habitat, including extensively grazed grasslands and fields with features like natural grassland, hedgerows, brushwood thickets and woodpiles. Left to right: The use of Wippbrett traps (left), sniffer dogs and tracking tubes. 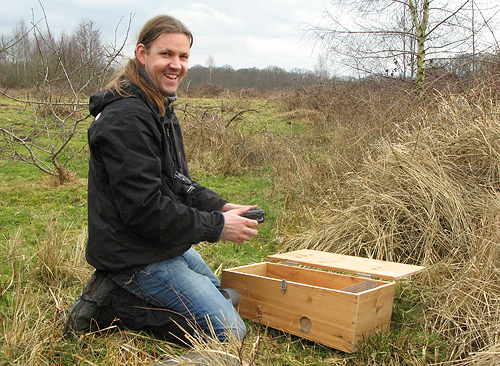 The means used to detect weasels and stoats are tracking tubes, a cameratrap box developed by Jeroen Mos called a “Mostela”, and Wippbrett-traps for live capture. The first two methods are essentially non-invasive. Concurrently the WKM monitors mouse and vole numbers as well as the presence of other meso-carnivores, mainly Pine marten, Stone marten and Red fox. Habitat features are studied as well. Occasionally Conservation Dog Services are called in to sniff out stoats. Weasels in particular live hidden from view in dense ground vegetation and in the dens of mice and moles. When they appear they often immediatly rapidly dissappear from view, giving but a undeterminable glimpse to the unsuspecting viewer. Over the years sightings have decreased, according to knowleadgable field people. 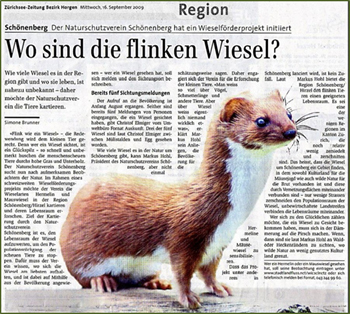 In September 2012 the WKM succesfully used tracking tubes and Mostelas to detect weasels in a nature restoration site of the Ark Foundation, in Limburg, a province in the south of Holland. Jeroen Mos setting out the “Mostela” he devised. It consists of a box with an open PVC tube in which small mammals (mice and weasels in this case) investigating it can be recorded with a cameratrap . The study area contained a great number of mice and voles (2012 was a good vole year). The trial showed that when present, as could be expected from high levels of small rodents, weasels can indeed be detected using a combination of the described methods. Recording of habitat features to learn about habitat choice of small Mustelids in the modern Dutch countryside with differential land-use management, photorecording from the air using a kite (by Jasja Dekker). The field trial in Limburg also delivered cameratrap recordings of pole cat, badgers, red squirrel and the siting of a stoat. The results of tube tracking, showing weasel prints. 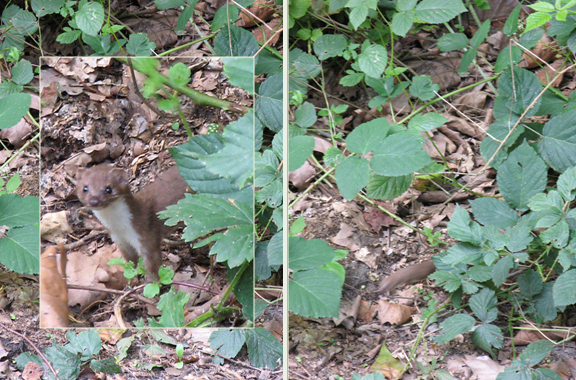 The tube tracking and camera trap recordings showed a close association of weasels with brushwood, as could be expected. One of the study areas in Wolfhaag, southern Limburg, the Netherlands, in September 2012. Here a number of weasels where recorded beside a great number of small rodents. The area is extensively managed by the Ark Foundation, i.e. with low-intensity grazing using semi-wild oxen. 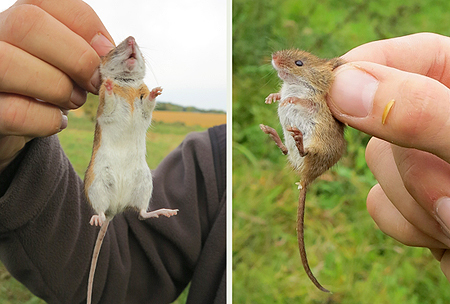 The small rodents caught with live traps included Harvest mouse, Wood mouse, Yellow-necked mouse, Bank voles and field voles . Small rodents are monitored to determine the food base and monitor population cycles of small Mustelids. Right: Yellow-necked mouse and (left) Harvest mouse. The involvement of volunteers or citizen scientists during fieldwork is regarded as essential to increase the number of surveys of small Mustelids by others in other parts of the Netherlands. Working with volunteers helps to strengthen the plight and support-base for the conservation of small Mustelids, a group of “forgotten” animals and low status in the conservation policy of the Netherlands. De WKM promotes conservation ecological research on small Mustelids in the Netherlands and aims to study the factors that are causing the decline of these small inconspicuous and seemingly “forgotten” group of carnivorous mammals in the Netherlands, including the possible ecotoxicological impact of SGARs. Above – Footage of weasels Mustela nivalis taken with the cameratrap box or “Mostela” devised by Jeroen Mos. The device can be effectively used for non-invasive detection of Least weasels, revealing their presence in dense ground vegetation, where conventional set-ups of cameratraps cannot be used. The first part of the video (with sound) shows a healthy and fattened male weasel filmed during the Wolfhaag study. The second film shows a female weasel filmed in an abandoned arable field. Note the size difference between the sexes.